Cake is central to the cozy experience. But it doesn’t just begin when you eat the cake (or cookies or pie) – it begins when you buy the ingredients. Go to your favorite market, choose your ingredients carefully, and mix them with great care, taking your time to enjoy the task at hand. It’s just a bonus that your baking will flood your space with delicious smells – and taste good too. They gather dust all year, so make use of them now! 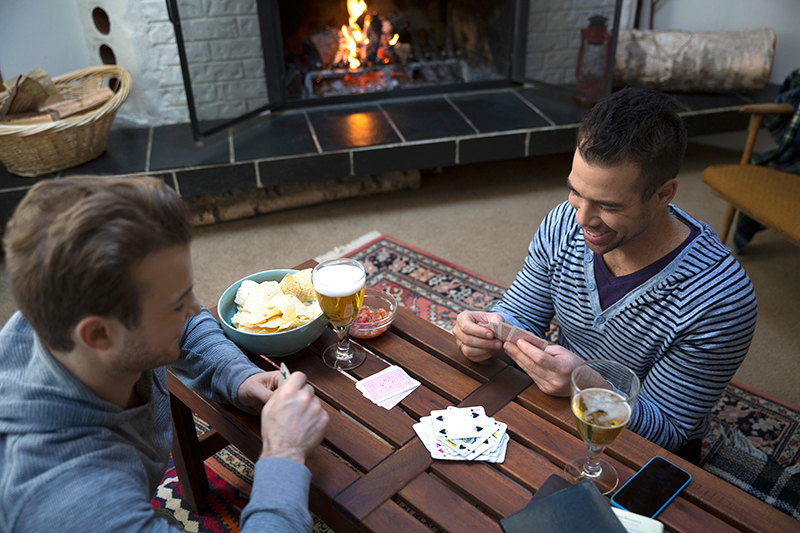 For the minimalists among us, a deck of cards is a highly versatile recreational object to keep around. No one to play with? Try your hand at a game of solitaire – analog style. Hot cocoa, hot toddies, apple cider, mulled wine – pick your poison. Whatever it is, find your own special recipe that is so delicious you can’t wait to show it off. Then have those aforementioned friends over again! If you don’t already have a favorite sweater, it’s time to find one. It should be something that makes you feel at home when you slip it on. Cashmere, wool, mohair – anything will do. Whatever you choose, pair it with thick socks! Tip: Start a knitting, crocheting or weaving circle, and make your own sweater over the course of the winter. It’s easier to get through lengthy projects when you’re sitting beside a friend – and it’s a great excuse to get together every week, no matter the weather. Tip: Instrumentals are classics for a reason – they can work as background for just about anything. When in doubt, most music services have pre-made playlists, some of which you can filter by mood.